Forgotten Cars: The "J" Stands For "Just Fine, Thank You Very Much"
Welcome to Forgotten Cars, where we highlight fascinating cars and engines that are obscure, unrecognized and lost to the passage of time. Back in the early 1990s, there were so many new Japanese luxury cars it was easy to lose track of them. 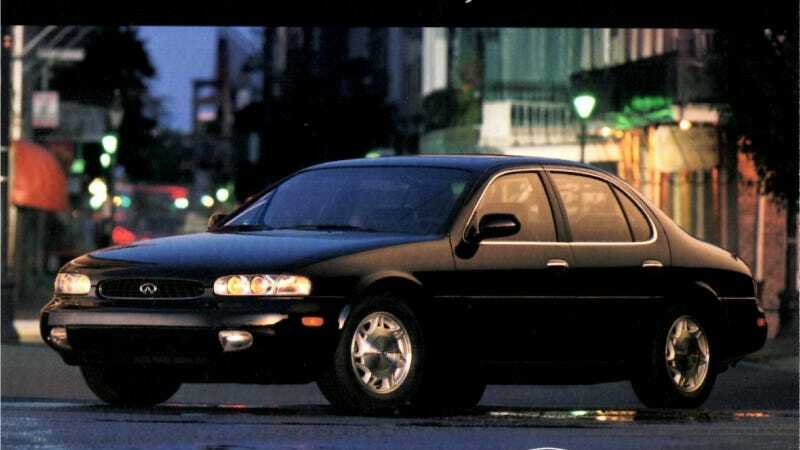 Last time we did Forgotten Cars, we discussed the Mazda Millenia and its Miller Cycle engine – memorable technology burried into a rather drab, if competent, car. In 1994, I had a copy of Automobile Magazine that had a little card stuck next to an ad for the Infiniti J30. In it, I wrote down my name and email address (presumably in crayon) and 8-10 weeks later received a VHS tape with a video about the J30. It was the most preposterous thing set to soft jazz even Kenny G would've hated and narrated by actor Jonathan Pryce, because a Welsh accent would really class things up. This, apparently, was going to get Baby Boomers to buy this car. You know, the people who really like reading T.C. Boyle novels. But the J30 wasn't a shapeless blob to come mostly from an American marketing department, like the M30 Coupe and Convertible or most low-level Acuras and Lexuses of the time. It was a Japanese market Nissan Leopard J Ferie (a less-than catchy name, but it got a 4.1-liter V8 that we didn't) that had all of the makings of a competitive sedan to do battle with BMW 325s and 525s and Mercedes C280s and the Acura Legend. Its styling was fairly unconventional, too. Yes, there are serious Jaguar overtones as pointed out by Paul Dean of the Los Angeles Times in his 1992 review, but name any luxury sedan of the era and few will call them adventurously styled. This is back before Volvos got curves and BMW got Bangled. The mechanicals of the J30 were of special note, too. Like the Mercedes and BMW establishment and unlike the Legend and Lexus ES300, it had rear-wheel drive. The J30 also had the 3.0-liter V6 engine out of the Nissan 300ZX, producing 210 horsepower in this car mated to a modern-for-the-time four-speed automatic. But on the slightly more sporting J30t, it was equipped with HICAS, Nissan-speak for four-wheel steering. Why didn't it work? For starters, it was expensive as hell for 1993 at $34,000. Although, the only options were the t package and a car phone, so it was well equipped. Consumer Guide may have said it was more balanced than competing models, but acceleration wasn't terribly sprightly with a heavy sedan bolted to that V6. And the packaging left something to be desired, because the car had less passenger space than the Sentra of the time. Then there was the whole issue of Infiniti's branding being so muddled at this point of time. $34,000 was a whole lot of coin for something many people wrote off as a gussied-up Nissan, and the fact it resembled the first-generation Altima did not do it favors. Someone seriously screwed that up. But back in the day, few reviewers said there was anything fundamentally flawed with the J30 and it probably deserved better than it did in its 4-year-run when it was superseded in 1997 by the front-wheel drive, fancy Maxima that was the I30. And there's the fact that these cars have stood up to the test of time. It seems like every week in Southern California I'll spot a couple that are sun faded and probably have 200,000 miles to go with the ugly stickers now slapped on the back window. Aside from the also-unloved Q45, the J30 is worth remembering as a car Infiniti actually got right in the ‘90s. Do you guys have any memories of the J30? Help us out, Jalops. We'd like to make Forgotten Cars a regular thing, but we need suggestions. We're looking for stuff that's really obscure and that even the most seasoned car experts know little about. Give us some ideas in the comments!